William Loden and his Dirty Movies co-creator Scotty Theunissen were motivated by one thing: "We really like Mystery Science Theater 3000. "But I prefer a live format," says Loden, who hosts the show at Move the Air Audio and is planning to expand into Black Lodge when the must-see movie emporium reopens on Cleveland. 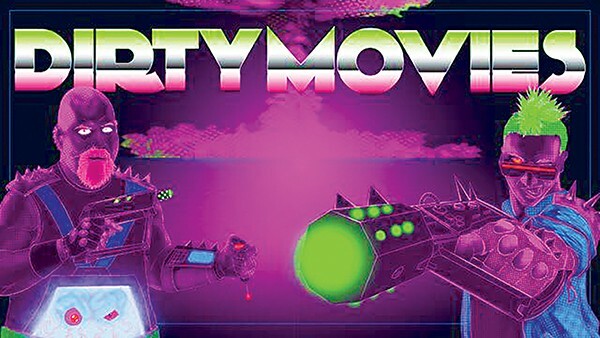 Following the example of MST3000 and other interruption-style shows, Dirty Movies brings together a clutch of local and touring comics to talk back to terrible movies. "Our emcee Charlie McMullen hosted a show similar to this in Colorado and so he has a truck full of really bad movies," Loden says, explaining how the animated feature Food Fight was selected for screening. "He described a movie starring Charlie Sheen and Hilary Duff as the main characters where they ran out of money a third of the way through production. And I trust his judgment." Running out of money isn't the only thing that went wrong with Food Fight, an action/adventure/inter-species romance set inside a grocery store and starring a number of actual and fictitious supermarket brand mascots like Captain Crunch and Chester the Cheetos cheetah. With its jarringly bad script, weird mix of motion capture and other unfinished animation styles, bizarre sexual overtones, and an all-star cast that also included Eva Longoria, Christopher Lloyd, Wayne Brady, and Harvey Fierstein, this famously plagued movie about well-known grocery store products defending their turf against the invasive Brand X, is a behind-the-scenes-tell-all-documentary waiting to happen. "We've got Kayla Esmond and Josh Ogle, two wonderful comics, coming from Little Rock and local favorite Judy Driscoll," Loden says. "It's good cheap entertainment that's not kid-friendly on a Friday night."